For more than 100 years, Hallmark has designed greeting cards for life's special moments. Hallmark Card Studio� 2017 for Mac extends this tradition, making it easy to create one-of-a-kind Hallmark cards as unique as the people you care for. But cards are just the beginning. Bridge the miles between family and friends with customizable photo frames, calendars, announcements, postcards, stationery, invitations, e-cards and scrapbook pages. Track birthdays and anniversaries using monthly and yearly calendars so that you never miss an important Hallmark card event again. Even import photos directly into your cards and projects from iPhoto or an iSight camera. With exclusive Hallmark sentiments and the Hallmark Premium Graphics Collection, your cards and projects will be more creative and heart-felt than ever before. It's amazing what you and Hallmark can do together. Spectacular Cards and So Much More! Commemorate events and bridge the miles between family and friends with invitations, photo frames, scrapbook pages, stationery, certificates, e-cards and much more! Commemorate the special events in your family's life by creating beautiful scrapbooks you'll treasure forever. Create personalized family photo cards for the holidays - or virtually any occasion. Email Cards and projects accross the miles to family and friends. - Create Personalized Cards in 3 Easy Steps. - Select from thousands of cards, invitations, stickers and more. - Add you own custom message or photos. The change fonts, colors or graphics. - Print, email or create a PDF of your one-of-kind creation. Hallmark Card Studio� 2017 for Mac makes selecting photos for cards and projects easy. And, there's no better way to personalize than by importing your favorite photos from iPhoto or an iSight camera. Create your own one-of-a-kind Hallmark cards for friends and family with Hallmark Card Studio� 2017 for Mac! It's the fast, easy and fun way to create customizable Hallmark cards for any occasion - from birthdays and anniversaries to Christmas and Valentine's Day! 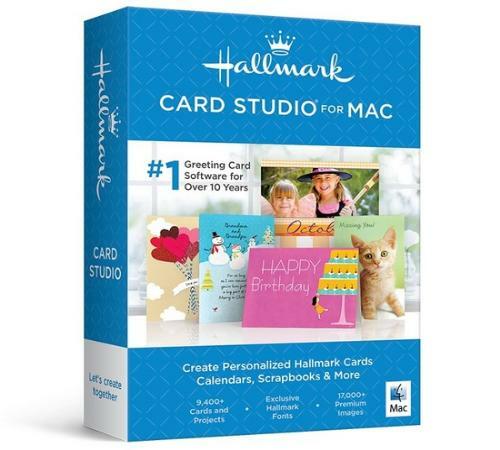 Hallmark Card Studio� 2017 for Mac also helps you capture life's special moments with scrapbook pages, photo frames, stationery, personalized invitations, stickers and certificates. Also included are personal calendars for monthly and yearly use. Add embellishments to your cards. Choose from thousands of premium clip art images! To give your cards a truly unique look, we've included a sensational array of clip art images suitable for any occasion. You can also import your own clip art if you prefer. - 2017 Mac Video Tutorial Gets You Started Fast!